Equus Film Festival, NYCRoopa Barua's paean to Manipuri women polo players, and their encounter with Team USPA, wins top Festival Directors Award at the Equus Film Festival. The patience and dedication of a few have given a new lease of life to the Manipur's dwindling pony population but there is a long way to go. In the Kingdom of Dying PoniesPolo hails from the forgotten, violent state of Manipur, India. Can anyone save its endangered, fabled horses ? International Polo and Pony PreservationA short by Stashd Films from Nagaland on Huntre! Equine's work with USPA and international polo on pony preservation. The 10th Manipur International Polo Tournament, 2016. How a polo tour in India is helping to protect a rare breed of poniesPersia claims to be the birthplace of polo, but the modern version of the game comes from the small state of Manipur in northeastern India. The British discovered it there and brought “hockey on horseback” to the West in the 19th century. These days, the West is going back to Manipur to play polo. Manipur’s court records talk about a game back in the 1st century AD and what’s different about polo in Manipur is that this not just a game for posh country clubs. Even ordinary villagers played it. Manipur Pony Conservation and Development Policy has been approved taking into account of the dwindling number of Manipuri pony, which is a rare species found only in the state. Amba Suhasini of NDTV Good Times visits the shrine to the Manipuri god of polo with preservation spearhead Somi Roy of Huntre! Equine. Steve Armour of the USPA and the Houston Polo Club, Ed Armstrong of Huntre! Equine and edwardjarmstrong.com, and L. Somi Roy of Hun-tre! discuss international prospects of Manipuri polo and the Manipuri Pony. Imphal. November 2014. The first of 53 ponies entered the Pony Nature Preserve in Heingang and Khundrakpam in time for USPA, German and Thai polo players to see the first phase of this preservation project to house Imphal's street ponies, homeless since ~1985. Spearheading the move for the preserve, the Chief Minister of Manipur, O. Ibobi Singh also declared the Manipuri Pony and Endangered Breed. January 17-21, 2018Six women's polo teams - Australia, Indian Polo Association, Kenya, Manipur Marjing, Manipur Thangjing, and USA - played in the field league tournament. Team Kenya took the BSE Cup. January 21, 2018Kenya edged United States of America 5-4 to clinch the 3rd Manipur Statehood Day Women’s Polo Tournament at Kangjeibung Grounds in Manipur..
January 17-21, 2018Six women's teams contested in the 3rd Manipur Statehood Day Women's Polo Tournament, presented by Manipur Tourism, in a field league tourney for the BSE Cup. Steve Armour, Governor-at-Large of the USPA, rings the closing bell at the Bombay Stock Exchange, with assistance from Annabel McNaught-Davis, captain of the Hurlingham Polo Association women’s polo team, after a luncheon hosted by Ashish Chauhan, CEO and Managing Director of the BSE. An Assam High Tea at Ministry of New, hosted by Roopa Barua and L. Somi Roy, partners in Hunter! Equine, and sponsored by TeaTrunk, followed. Team USPA Women won 9-3 over Hurlingham in the 2nd Manipur Statehood Day Women’s Polo Tournament at Mapal Kangjeibung Polo Ground in Imphal. The three-way league also featured Manipur. The tournament was sponsored by Manipur Tourim, and organized by All Manipur Polo Association. Nasr Polo Club of Hyderabad hosted a four-day polo clinic and arena tournament in Hyderabad. The clinics were conducted by Team USPA Women and were held in the morning. The games featured mixed teams of American players from Team USPA and women players from Hyderabad, Chennai and New Delhi. Trophies awarded were the Mir Mahbub Ali Khan Nizam VI & Sir Viqar Um-Umra Cup and the CM Cup. Maharaja Sawai Padmanabh Singh of Jaipur invited Team USPA to play at Mundota Fort and Palace in Jaipur. The mixed teams also included men and women players from India, England and Switzerland and played for the Antriksh India Jaipur Gold Cup. It was hosted and organized by Vikram Singh Rathore of the House of Mundota, Jaipur. The India International Women's Polo Tour of India features Team USPA Women and Hurlingham Polo Association at games and coaching clinics at Jaipur, Hyderabad and Imphal. Team USPA Women’s India tour in January was the first time a women’s polo team had visited the country. The team, composed of Cristina Fernandez, Carly Persano, Tiamo Hudspeth and Julia Smith, was led by Steve Armour. 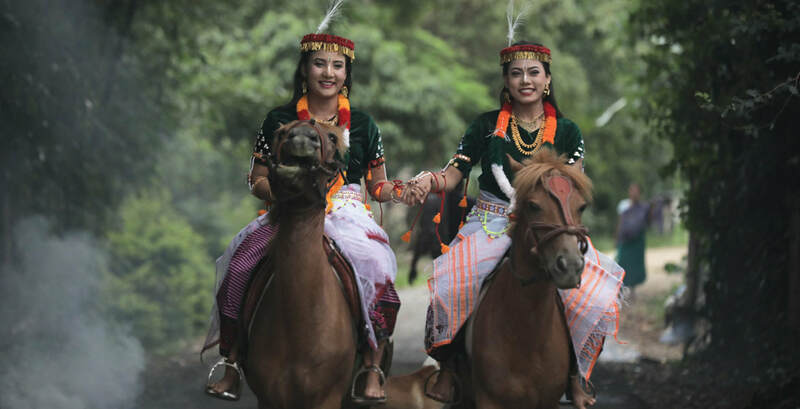 Discover an exciting new frontier, India’s North East Region, with a unique equestrian adventure in Manipur and a celebration of tribal culture and sports in Nagaland. With Thomas Cook International and Emma Horne Travel. Hun-tre Polo Tours arranged for the Genghis Khan Polo and Riding Club of Ulaan Bataar and the US from Team USPA to play in the 8th Manipur Polo International Polo Tournament. A six-member USA team organized by the United States Polo Association was brought by Huntre! to play in the 7th International Manipur Polo Tournament, held in Imphal from November 23-28, 2013. Australian, Kenyan, American and Indian women polo players' polo adventure in Manipur. Fan video of "Mundian to Bach Ke ("Beware of the Boys" -Jay-Z Mix)" by Panjabi MC & Jay-Z. Podcast on Women's Polo from US Team polo player Eva Crossman of Lexington KY on FindingTheVoices.com podcast from Md, USA, with host Monica Ingudam. Polo Yatra 2017 in Jaipur and Hyderabad Polo Yatra 2017 was held in Jaipur and Hyderabad with Team USPA Women before Hurlingham Polo Association joined them in Imphal. Video by Roopa Barua, partner in Huntre! Equine. Polo Yatra 2017: US Consulate in Hyderabad Salutes Women's PoloWatch this video on Team USPA Women and Indian players game at Nasr Polo. Polo Yatra 2017: Verve Celebrates Women’s PoloIndia’s foremost lifestyle magazine for women attends a high tea for Team USPA Women and Hurlingham Polo Association at Ministry of New, Mumbai, hosted by TeaTrunk. Jetwings India On Manipuri Women’s PoloIn Jet Airways in-flight magazine, Ananya Bahl situates Manipuri women’s polo in the context of women’s sports and cultural activity in Manipur. Polo Yatra 2017: On American And British Women’s PoloSteve Armour, Governor-at-Large of the USPA and manager/leader, and player Audry Persano of Team USPA Women, and Annabel McNaught-Davies, captain of Hurlingham Polo Association, talk about international women’s polo on Impact TV, Manipur. Polo Yatra 2017: Hyderabad Presents Women Polo PlayersRajvi Rao and Chaya headline women’s polo in Hyderabad: A good start to developing women’s polo in South India. Polo Yatra 2017: Hyderabad Toasts Indian Women’s PoloRaunaq Yar Khan, scion of the Nizam of Hyderabad, hosts a hilltop party for USPA and Indian women polo players prior to presenting the cup in honor of Mir Mahboob Ali Khan, Nizam VI of Hyderabad and Sir Viqar Um-Umra. USPA And Women’s Polo In Imphal And JaipurFilmmaker Roopa Barua covers the 1st Manipur Statehood Day Women’s Polo Tournament in Imphal and Cowgirls v Gopis exhibition game in Jaipur, featuring Team USPA Women. Conde Nast Traveller India On Polo In ManipurSandip Roy writes, with photography by Jasper Johns, on the India’s first women’s polo tournament, and more, Manipur, featuring Team USPA Women. Spain’s Polo Lady Covers Team USPA Women In ManipurThe world’s only women’s polo magazine covers India’s first women’s polo tournament, featuring Team USPA Women, playing in Imphal and Jaipur. Huntré! Equine LLP is a social enterprise that seeks to leverage the nexus of sports and culture by using strategies involving sports policy, events, arts and media, education, and infrastructure. Our working partners are Roopa Barua (Mumbai), Cherian Mathai (New York), and Edward Armstrong (Massachusetts, US). Emma Horne Travel is our travel partner for Huntre!Adventures, our polo and sports tours initiative. L. Somi Roy (Promoter) has been working with Ed Armstrong and the United States Polo Association (USPA) to bring polo teams from the USA since 2013. This has led to to Huntre! Equine'sPolo Yatra, the first international women's polo tour of India, now in its third year and widened to in four cities across the country, and including teams from England, Kenya and Australia. He is also working on conserving the endangered Manipuri Pony, having organized an exhibit on Manipuri polo at the International Museum of the Horse in Kentucky, and is currently spearheading the development of a natural pony preserve that he helped establish in Manipur in 2013. He organized four Major League Baseball coaching camps, and re:PLAY, an international film festival for three years on performance and sports in his native Manipur. Roy has curated for the Museum of Modern Art, for whom he is currently developing Indian film exhibitions as a guest curator, Lincoln Center, Whitney Museum, Robert Flaherty Film Seminar, The Asia Society, the American Museum of the Moving Image and UCLA. He has served as the festival director for the Asia Society, Gold Coast International Film Festival, the Asian American International Film Festival and the New York Indian Film Festival (formerly MIAAC) in the US. His exhibitions have been seen in China, India, Indonesia and Israel. He has also curated public media exhibitions including first video exhibition in Times Square, for Richard Gere and Tibet House, and at the Continental Atrium, the first on-going public video exhibition in New York. His exhibition on animation art was shown at the Atlanta Olympics and the Beijing International Conference on Women. He was the HD Producer in New York for Tokyo Broadcasting System. Roy has taught at New York University and written on film and the arts for international journals and lectured at the National Geographic Society, the Asia Society and the Smithsonian Institution. His translations of Manipuri literature have been published by Thema and Zubaan Books. In 2014, he started Imasi Publications, an imprint of Imasi: The Maharaj Kumari Binodini Devi Foundation in Manipur, of which he is the Founder and Managing Trustee. About Huntré! EquineHuntré! Equine LLP is a social enterprise that seeks to leverage the nexus of sports and culture by using strategies involving sports policy, events, arts and media, education, and infrastructure. The partnership’s undertakings will use comparative advantages from international, national and regional practices, drawing upon the networks of its partners so as to create positive linkages between sports, culture, industry, commerce and education.